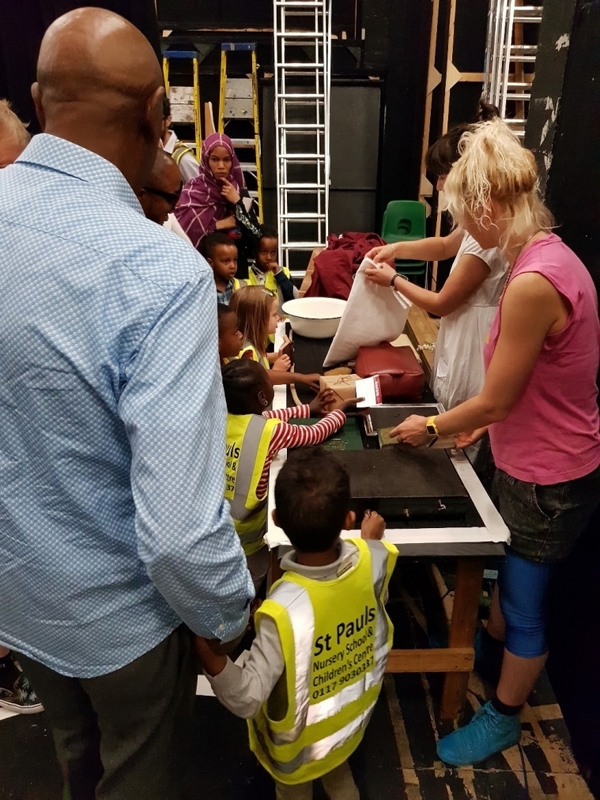 Since November 2017, Bristol Old Vic have been working alongside St. Paul’s Nursery to set up and run sessions with a variety of different families. In our application to the Heritage Lottery Fund, we identified the St. Paul’s area of Bristol as an area of low engagement with the theatre. We were aware of the variety of barriers stopping these families from engaging with the theatre and the work we’re doing, so we worked to remove both the physical and perceived barriers that were stopping access to the building. Working with practitioners Malcolm Hamilton, Katie Storer and Jessica Hoffman, and nursery lead Robin Taylor, our family workshops were able to reach beyond language and location barriers and engage a huge amount of the families that regularly use the nursery. A lot of these families we involved were newly arrived refugees to Britain, or people for whom English was a second language. St. Paul’s Nursery staff were incredibly helpful, providing us with access to their interpreters, community workers and facilities to figure out how we can bring a little bit of theatre to these families. We began by crafting a series of workshops that explored what a theatre is whilst exploring the context of the building and its history. Trying to pitch that to very young children was difficult enough, but we also wanted it to appeal to their parents/guardians and other family members that might be with them! 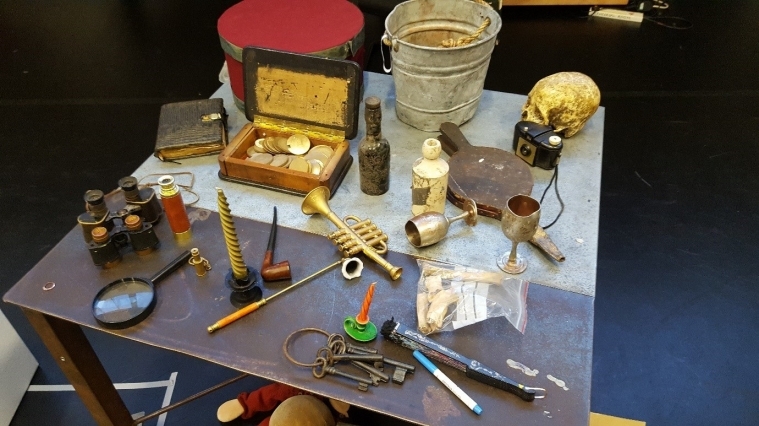 This added an extra challenge, but by bringing an assortment of props and other items from the theatre, we were able to find something to interest everyone. After seven weeks at St. Paul’s Nursery, our sessions concluded in June with the families coming into the theatre complex to actually see the building they’d been hearing about for the first time. 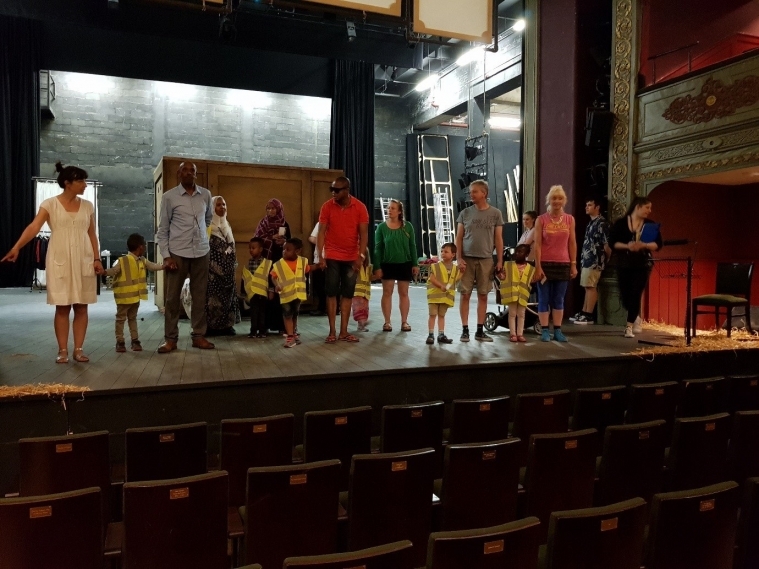 This was a fantastic moment, as many of the participants had never stepped foot inside a theatre before, especially not one as old, or nationally significant as Bristol Old Vic is. Below, you can read Malcolm, Katie, Jess and Robin’s thoughts about what they liked about getting involved with this project. Hello. My name is Jess Hoffmann and I am a theatre maker based in Bristol. 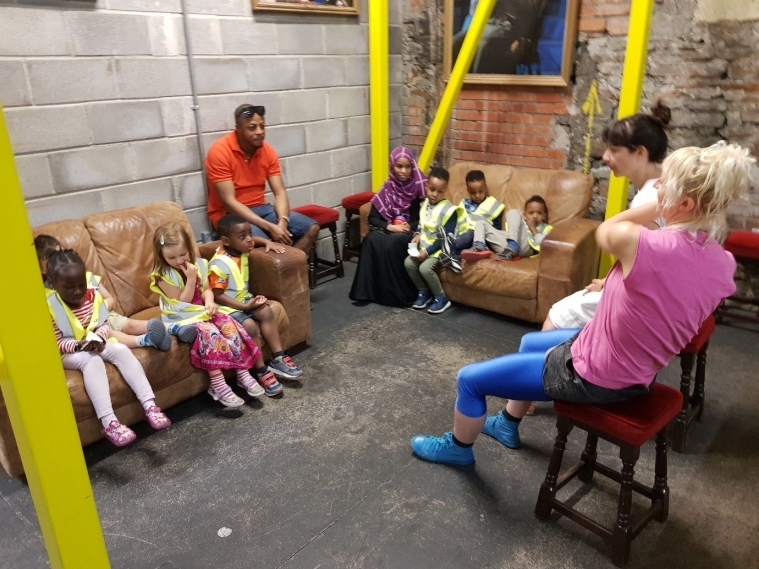 Alongside Malcolm Hamilton and Katie Storer (brilliant theatre makers), we recently delivered a project working with pre-school children and their families, exploring the heritage of the Bristol Old Vic. We ran 6 weekly sessions at St Paul’s Nursery, with a final session taking place at the Bristol Old Vic. Each week we explored a specific theme, such as lighting or costume, through play and storytelling, and thought about what Bristol and the Bristol Old Vic would have been like when it first opened over 250 years ago. What I loved about the project was spending time playing. 4 year olds have amazing imaginations, so it was a real joy to explore what makes a theatre together. One session that stands out to me was on lighting. We made the room dark and brought in torches and battery lit candles. We told stories with shadow puppets and created shapes on the floor with gobos that they had made. We lit mini wooden theatres and imagined what shows would be told inside them. The atmosphere was calm and magical. For that hour the room became a place of wonder. At the end of every session we all went on a ‘walk’ to the Bristol Old Vic. It described walking from Bristol Bridge, past the Llandoger Trow pub to the BOV in 1776. At the nursery we paraded around their playground imagining seeing sailors arriving on ships, walking on cobble stones, avoiding slop buckets, following an elephant on the way to the theatre, and finally arriving at the entrance and getting tickets to see the show. On the last session the children and parents met us close to Bristol Bridge and we did the same walk. For me, this was the moment when what we had been doing with them at the nursery landed. They walked into the theatre and stood on the main stage and saw the lighting we had been talking about, they saw props and costume being used for the show happening that night and stood together and felt what it was like to take a bow. And they deserved a big round of applause because they were all brilliant. Amongst many other things, one of the aspects I enjoyed about this project was workshopping the ideas for the content of the sessions. One component we chose to focus on was ‘Theatre as ceremony’/the act of going to the theatre. Looking at the heritage aspect we found the game of ‘how big and flamboyant can I make a hat?’ Our exploration (which ended being a ceremonious part of every session) was of the journey to the theatre; an imaginative exploration into what we think it might have been like 250 years ago as we walked to the theatre - what would we see? Who would we meet? What could we smell? One of our curiosities we focussed on in the first few weeks was on old props. Items such as a simple telephone became a source of wonder - what is this thing? Why is it so big? Why does it have a separate speaking part and listening part? Who would answer if I turned the dials and waited? Each session we would arrive with a few ideas of games, explorations and curiosities, whilst making sure that we left ample room for these to be found by the children themselves. For our lighting session we brought along the following offerings: - A puppet theatre with a shadow screen, some torches and objects. - Small wooden blocks and shapes, LED tea lights, and play figures (these could act as simple stages with set, props and actors). - Paper, scissors, torches (that we could craft simple Gobos from). - Big rolls of paper and pens. - Materials and structures to build dens from. Amongst those offerings, they found games of Big and Small; ‘How big and how small can I make the shadow on the shadow puppet theatre by shining a light behind an object?’ Games of Light and Dark; ‘Where can I hide a figure so that it is in the shadow on my set?’ Explorations came from the cutting of various different shapes in the paper, then shining a torch through them - ‘Does my shape look different in its shadow form than it does on the paper?’ Curiosities arose through shining the torches on different materials ‘how does the light appear different on this material than the one I shined it on before?’ - This one curiosity could keep some children intrigued for the entirety of the session. Seeing the world through children’s eyes is a wonderful thing. We don’t need to know why or how a certain thing is the way it is or what it means, we just play and observe the feeling. When watching theatre it is a similar process, apart from you’re watching someone else play whilst you observe your own feeling from it. 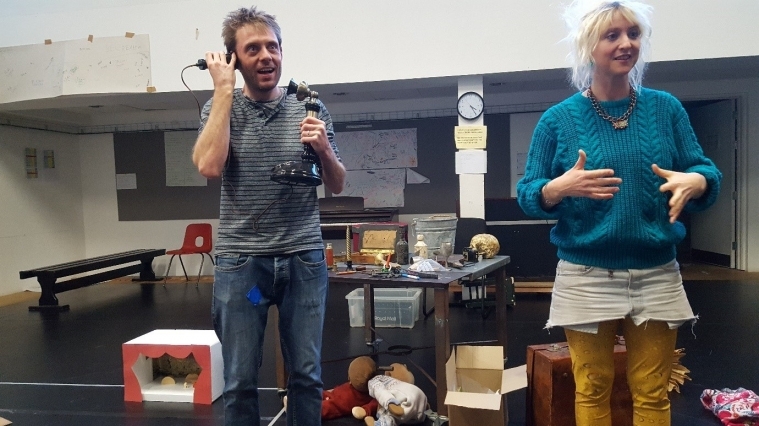 We’ve been designing and delivering play sessions to engage young children and their families in the heritage and history of Bristol Old Vic Theatre. We prototyped in late 2017, then ran 8 sessions in the summer term, all at St Pauls Nursery School and Children’s Centre. Then recreating those elements through play in the classroom. 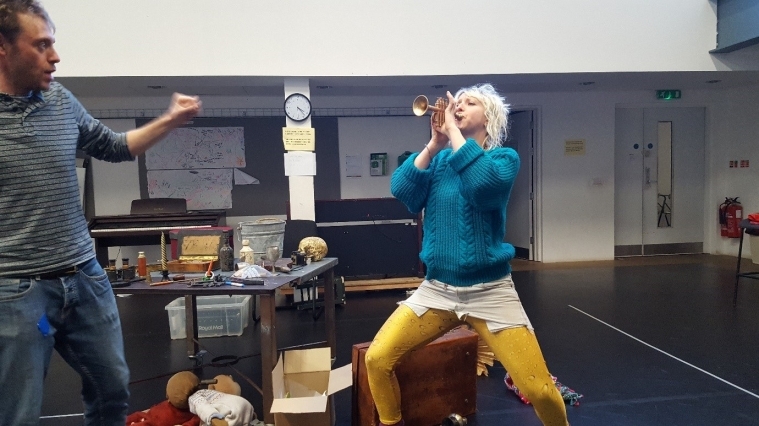 It’s been quite a funny head-and-toe up-side-down exercise, because as grown-ups making theatre we use children’s play to, well, make up plays so reversing that back down to explain theatre is rather topsy-turvy! Each week we set up a craft activity set around an element- hat making, shadows, painted backdrops, rain sticks and shakers- then left space for the children to explore. Inevitably stories began to develop and we followed impulses to go on journeys following trains, firefighters, cats, trees and children on madcap adventures! Picking up a set of bellows, a Somalian father explained that they used large bellows in his country for the fire, that he had a bog set and would get them next time he returned there. Playing with a tin loudspeaker, two women explained that they used those to listen for animals while hunting or to call to others across outdoor spaces. Again and again objects that we had one relationship to were shown to have very different stories to our players. Lighting was a particularly interesting session. We blacked out the room and played with torches and shadows. Instantly the (usually rowdy) room became hushed and the whole hour was whispered! The group played more slowly, and explored the room and the objects in a completely different rhythm, even tip-toeing and moving differently. The SS Great Britain were kind enough to lend us costumes and we all had a great time (parents included) dressing up and becoming other people. We had a sort of puppet theatre built that could be the box office, ice cream counter or tuck shop and this almost always became the stage for a final ‘show’ by the children. One of the loveliest elements that we added into this set of workshops was ‘a walk to the theatre’. To round off the hour, we would go outside and imagine ourselves by Bristol Bridge. Using words and actions we would paint the characters and the atmosphere of the bridge in 1766, of the boats and harbour, then we would go on a journey along cobbled streets, past wonky pubs and eventually to the stage door. Repetition was a strong part of our workshops- each session would only change a little each week, and the walk was a lovely way to play the same game and cement the session. We would layer the story with sounds, actions and noises- running away form a bucket of slops; gasping at the sight of an elephant, handing our tickets to the usher. Finally, on the last week, we brought the children into town and did the walk for real. We found this to be a magical way of layering the past onto the present and something we intend to develop further. Lo-fi augmented reality if you like. We’re excited to be continuing the work this Autumn. Thanks to St Pauls Nursery School and Children’s Centre and of course the Bristol Old Vic for inviting us to play with them! 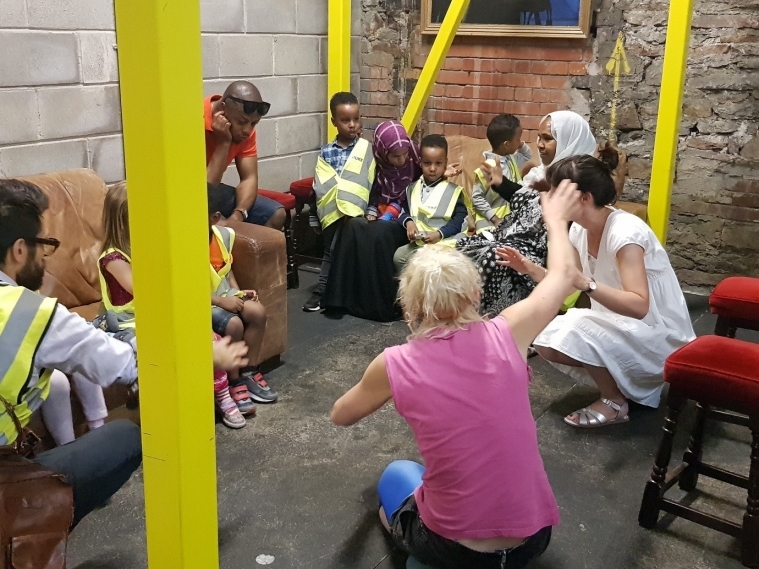 Each week performers, children and families have told stories and created narratives using themes from the theatre, travelling an ‘imaginary journey’ around Bristol Docks and the Bristol Old Vic. We were “getting physical”, “being imaginative” and “telling tales”! Magic phones! Old treasure boxes! Costumes, puppets and lights! Sound and music! What a magical experience full of wonderment, novelty, creativity and connections for children, parents, families, teachers and performers! Culminating in a visit for families to the theatre itself. Take the stage! Lights up! Take a bow! Here’s some quotes from some of the participants on what they took away from the project.